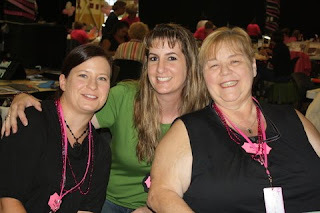 Smiley Cards Mini Blog Hop !!! Next hop on over to CARA !!! 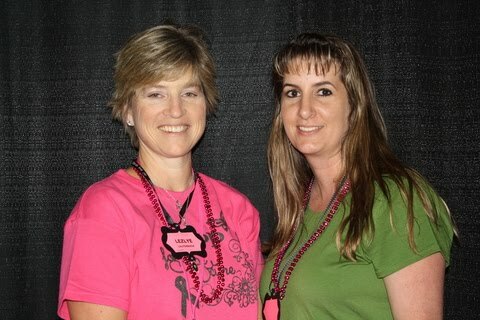 So the next Cricut class will be Saturday November 13 th !!! We will be making a "Give Thanks" bucket. 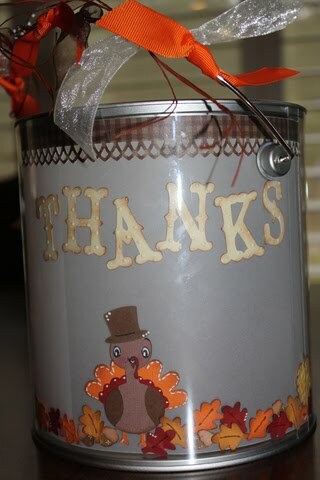 You can have people write what they are thankful for and put it in the bucket, then you can read them at Thanksgiving dinner or keep them till the following Thanksgiving and see what people wrote! I have designed the bucket with vellum so you can also put a flameless candle inside of it, If you dont want to use the idea above. During this class we will learn inking, what Peachy Keen Stamps are and how to use them, and using the Cuttlebug. We will ALSO be making a Christmas ornament pics coming soon. This is a few pictures of the bucket we will also decorate the lid and install a handle on the top! Challenge Entry- Peachy Keen Fall Home Decor item using Critter Faces!!! 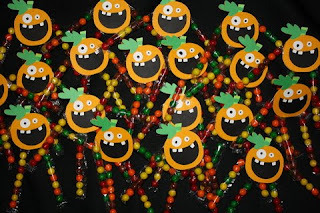 Getting ready for Halloween !!! Everyone ready for Halloween? This week over at the Fantabulous Cricut were all about Halloween. Its not to late to make something special! 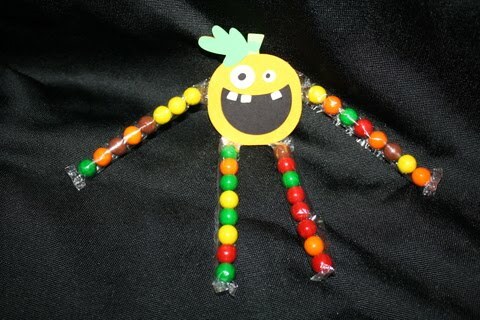 These were actually made by my 5 year old. She absolutely LOVES to make stuff with mom. I helped her with gluing the teeth but other than that for the most part she did it all! We made 52 in all. They are for the kids in her class, friends and family. So how you can make your own? 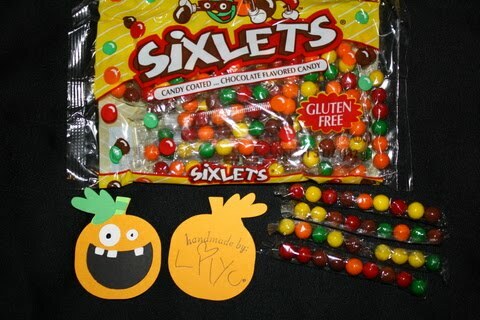 The Sixlets were purchased at the dollar store. The pumpkin was cut from Mini Monsters then I cut an extra pumpkin hiding all the cut lines for the back. We used glue dots to attach the sixlets before adding the back. 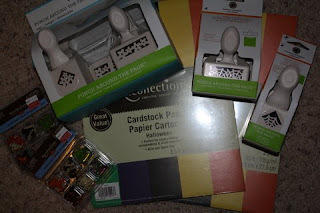 Everything was on clearnace I didnt even use a coupon !LOL The brads were $1.49, punches $5.99, Cardstock $1.99 and punch around the page $14.99 reg over $30 ! 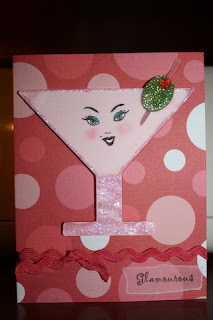 If so could you take a moment and click on this link HERE and make a COMMENT under the card. Its in a contest for a gift certificate, the one with the most comments win! I was so excited to get my first order for cards for a childrens store here locally, so I wanted to share with you one of them. 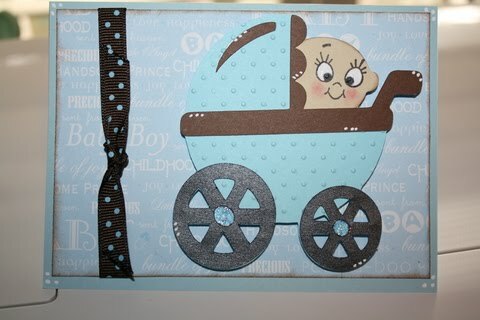 This card is made with Simply Charmed and the swiss dot Cuttlebug folder I also used Peachy Keen Baby faces !!! Hi Everyone! It's Monday time for the new Fantabulous Cricut Challenge. This weeks challenge is create something and incorporate a leaf into the project! This is vinyl on a 13x13 tile. I used alot of cartridges including Heritage, Walk in My Garden, October 31st, Don Juan, Sentimentals, Serenade and Pumpkin Carving !! Head on over to the FCCB and join us in this challenge! HI ! I wanted to try my Imagine with a regular Cricut cartridge. 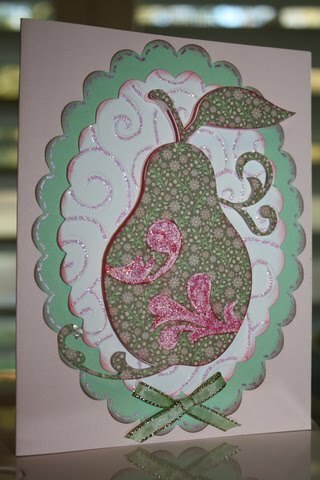 I chose Wall Decor for the pear, then used the pattern paper on the Imagine Nursery Rhymes to get the cute pattern. I also used Lacy Labels to cut the scallops. I used the Imagine on the "cut only" option and used colored paper (and white). 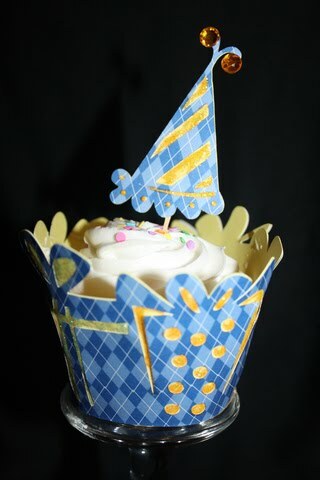 On the white scalloped oval I used Divine Swirls embossing folder then enhanced it with Stickles. This weeks challenge at My Creative Time is to create something with the Imagine and stamp a sentiment on it. So I used MPS stamps on the inside for the sentiment and a Martha Stewart punch for the borders. This was made for my in-laws Anniversary! This weeks challenge for Circle members is to create something with 3 out of these 5 things...pink, jewels and glitter, scallops, ruffels, flourishes. So I used Scallops, pink, jewels and glitter ! 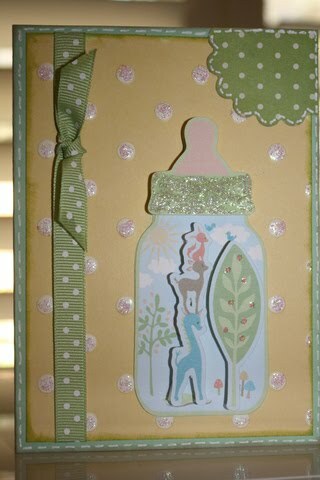 I used Lacy Labels for the oval scallops, Paper doll dress up for the Cricut gal, Peachy Keen princess stamps, and Divine Swirls Cuttlebug folder !!! Keep your fingers crossed ! ☺~ Enjoy! OMG OMG !!! 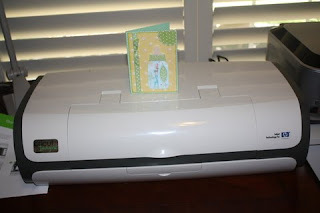 Have you seen this this 56 page document of all the new Machines Cricut has coming out~!!! A Wood cutting machine, Engraver, Jewelry Maker, WiFi, 3D Scanner, 3D printer, Garmet printer and MORE !!! All I've got to say is Good Grief !!!!!!!!! This weeks challenge at the Fantabulous Cricut is to create something for the wall. 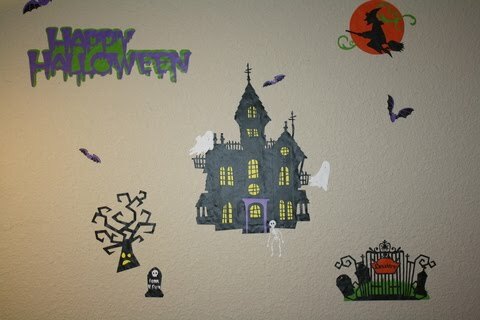 Also Cricut me that's challenge is to create something for Halloween !!! I love creating things for the wall. 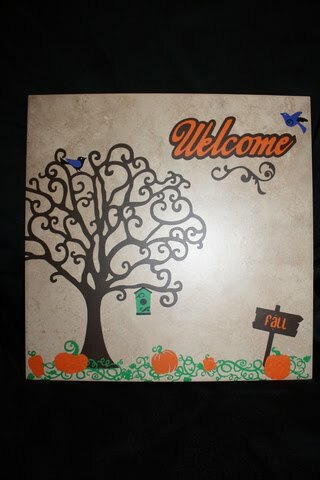 I have a "Cricut" wall in my house that is seen from the kitchen, dining room, living room and front door. I change the scene for each holiday or special occasion. My kids LOVE these creations. 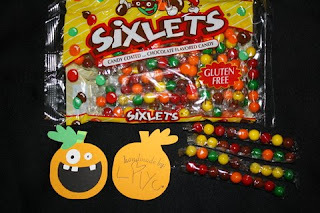 My daughter LOVES Halloween so she wanted "scary" stuff! 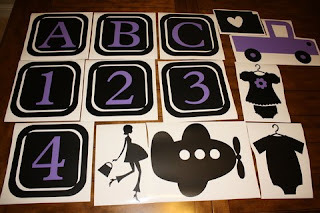 SOOOO the children's store that I'm making cards for ...the owner wants me to do some vinyl for her walls. Everything was cut with New Arrival and Plantin Schoolbook. I did create the "blocks" by altering some of the image with my gypsy, its actually 3 blocks in each block to get the cuts in them! The blocks are 11 3/4 x 11 3/4. The airplane and truck are even bigger! I received my Imagine last night !!! whoo hoo!!! I got it set up, updated, calibrated, and I made a card with it! Here's the beautiful machine and my first project with Nursery Tails!!! Looks good on my desk doesn't it? 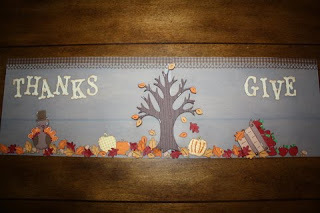 This weeks challenge at the Fantabulous Cricut Challenge Blog is Bake and Decorate! I have been wanting to try out the Cupcake Wrapper cartridge, so this was the perfect time! 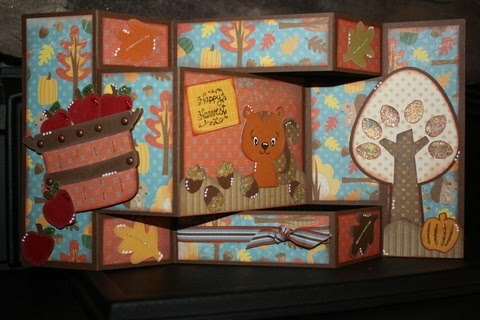 I'm SOOO excited my card is this week's Facebook feature for Peachy Keen stamps! I absolutely LOVE their stamps! To see it on facebook click HERE. 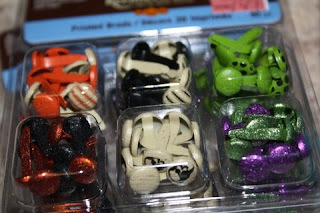 Also ribbon, stickles, PK medium critter stamps, gel pen and brads. Enjoy!